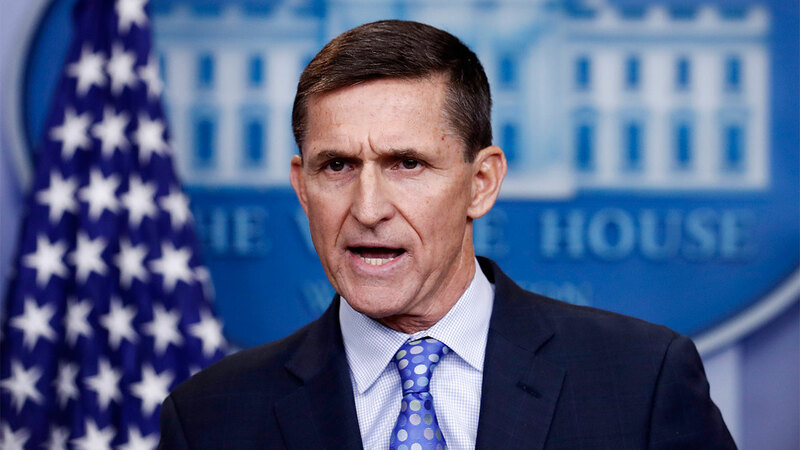 WASHINGTON -- President Donald Trump's embattled national security adviser Michael Flynn resigned late Monday night, following reports that he had misled Vice President Mike Pence and other officials about his contacts with Russia. His departure upends Trump's senior team after less than one month in office. In a resignation letter, Flynn said he held numerous calls with the Russian ambassador to the U.S. during the transition and gave "incomplete information" about those discussions to Vice President Mike Pence. The vice president, apparently relying on information from Flynn, initially said the national security adviser had not discussed sanctions with the Russian envoy, though Flynn later conceded the issue may have come up. The revelations were another destabilizing blow to an administration that has already suffered a major legal defeat, botched the implementation of a signature policy and stumbled through a string of embarrassing public relations missteps. Trump on Monday named retired Lt. Gen. Keith Kellogg as the acting national security adviser. Kellogg had previously been appointed the National Security Council chief of staff and advised Trump on national security issues during the campaign. Trump is also considering former CIA Director David Petraeus and Vice Admiral Robert Harward, a U.S. Navy SEAL, for the post, according to a senior administration official. The Trump team's account of Flynn's discussions with the Russian envoy changed repeatedly over several weeks, including the number of contacts, the dates of those contacts and, ultimately, the content of the conversations. Last month, the Justice Department warned the Trump administration that Flynn could be in a compromised position as a result of the contradictions between the public depictions of the calls and what intelligence officials knew to be true based on recordings of the conversations, which were picked up as part of routine monitoring of foreign officials communications in the U.S.
An administration official and two people with knowledge of the situation confirmed the Justice Department warnings on the condition of anonymity because they were not authorized to discuss the matter publicly. It was unclear when Trump and Pence learned about the Justice Department outreach. The Washington Post was the first to report the communication between former acting attorney general Sally Yates, a holdover from the Obama administration, and the Trump White House. Even before the Post report, the White House was signaling that Flynn's future was in doubt. White House spokesman Sean Spicer said Trump was "evaluating the situation" and consulting with Pence on Monday about his conversations with the national security adviser. Asked whether the president had been aware that Flynn might have discussed sanctions with the Russian envoy, Spicer said, "No, absolutely not." Trump, who comments on a steady stream of issues on his Twitter feed, had been conspicuously silent about the matter since The Washington Post reported last week that Flynn had discussed sanctions with the Russian envoy. A U.S. official told The Associated Press that Flynn was in frequent contact with Ambassador Sergey Kislyak on the day the Obama administration slapped sanctions on Russia for election-related hacking, as well as at other times during the transition. Flynn's discussions with the Russian raised questions about whether Flynn offered assurances about the incoming administration's new approach. Such conversations would breach diplomatic protocol and possibly violate the Logan Act, a law aimed at keeping citizens from conducting diplomacy. Earlier Monday, White House counselor Kellyanne Conway said Trump had "full confidence" in Flynn, though her assertions were not backed up by other senior Trump aides. Flynn was spotted near the Oval Office just after 10 p.m. Monday. Amid the uncertainty over Flynn's future, several of the president's top advisers, including chief of staff Reince Priebus and counsel Don McGahn, ducked in and out of late-night meetings in the West Wing. Several House Democrats called on Oversight Committee Chairman Jason Chaffetz, R-Utah, to launch an investigation into Flynn's ties to Russia. House Democratic leader Nancy Pelosi called for Flynn to be fired, saying he "cannot be trusted not to put Putin before America." Republican Sen. Susan Collins of Maine said that if Pence were misled, "I can't imagine he would have trust in Gen. Flynn going forward." She said it would also be "troubling" if Flynn had been negotiating with a foreign government before taking office. It's illegal for private citizens to conduct U.S. diplomacy. Flynn's conversations also raise questions about Trump's friendly posture toward Russia after U.S. intelligence agencies concluded that Moscow hacked Democratic emails during the election. Flynn's resignation comes as Trump and his top advisers seek to steady the White House after a rocky start. The president, who seeks input from a wide range of business associates, friends and colleagues, has been asking people their opinions on his senior team, including Spicer and Priebus. Advisers have privately conceded that the White House spit out too many disparate messages in the first few weeks, though they also note that the president's own tweets sometimes muddy the day's plans before most of the White House staff has arrived for work. Trump voiced support for Priebus Monday, saying the chief of staff was doing, "not a good job, a great job." But he did not make a similar show of support for his national security adviser. Flynn sat in the front row of Trump's news conference with Canadian Prime Minister Justin Trudeau earlier Monday. The president did not receive a question about Flynn's future from the two reporters who were called upon, and he ignored journalists' shouted follow-up inquiries as he left the room. Over the weekend, Trump told associates he was troubled by the situation, but did not say whether he planned to ask Flynn to step down, according to a person who spoke with him recently. Flynn was a loyal Trump supporter during the campaign, but he is viewed skeptically by some in the administration's national security circles, in part because of his ties to Russia. In 2015, Flynn was paid to attend a gala dinner for Russia Today, a Kremlin-backed television station, and sat next to Russian President Vladimir Putin during the event. Flynn spoke with the vice president about the matter twice on Friday, according to an administration official. The official said Pence was relying on information from Flynn when he went on television and denied that sanctions were discussed with Kislyak. Kellogg takes the helm of the National Security Council at a time when the young administration is grappling with a series of national security challenges, including North Korea's reported ballistic missile launch. The president, who was joined at his Mar-a-Lago estate by Japanese Prime Minister Shinzo Abe over the weekend, voiced solidarity with Japan. The White House is also dealing with fallout from the rocky rollout of Trump's immigration executive order, which has been blocked by the courts. The order was intended to suspend the nation's refugee program and bar citizens of seven Muslim-majority countries from entering the United States.